I have a grand idea FABIO, go buy the printed supertopo book that is reference at the top of this page ("Where to find a topo for North America Wall"). Chris has worked hard to create such a great compilation of topos. Support him - buy the book!!! Little chatter about this route. Do ya think it may top Zodiac with out getting much harder. Could it possibly get more shade in AUG. I've rope solo'd the first four pitches, which I heard were some of the harder pitches, despite being close to the ground and thus subject to "sport aiding". But nothing harder than zodiac (at least the zodiac in '95). Shade: as much as I remember, it only really gets afternoon shade. And all the black rock, it probably roasts in the summer. I don't know about "braver." We had two sets of Alien Offsets (which = braveness in my book) and never placed more then 3 Saweds on any pitch, and I think that was only on p2. On p20 we left the pig on the Cyclops bivi anchors at 19 and only belayed from the optional belay. We were able to haul with a 60m from p19 anchor to p21 natural anchor. Had to tandem lower/out and haul not to send loose talus off the ledges. Trying to figure out which pitches link with a 60m rope if soloing. Supertaco shows that these pitched potentialy link, can anyone confirm? 17->18 Black cave roof and next pitch. Now also, Russ's topo has me confused...it has different beta then ST. It shows you can fix to ground from p2 with one 60m and from Mazaltan to ground with 120m. Can anyone confirm this? Also shows you can go from 12-15 with a 60m with mucho back cleaning. yes/no? I climbed this route in '02. 10 & 11 definitely link. Linking 13 & 14 gives you the added benefit of a straight haul. 17 & 18 wiould link if soloing (not sure Id reccomend it though). Linked 20 and 21 and then 22 & 23. Watch out for the haul line snagging flake just below the lip of big sur. While climbing at the base of P.O. wall, some rock fall hit portions of this route and the foot stool. I saw at least 4 basketball sized chunks of rock explode on the ground and footstool. Be careful out there. 1 & 2 do not link with a 60 meter. However, it is 60 meters from the pitch 2 belay to the ground. Same thing for 3 & 4. Don't link, but you could haul/rap 3 & 4 in one 60 meter pull. Fix to 4 on day 1. Rap from 4 to 2 and 2 to the ground. Thanks for the rockfall warning macgyver...you have just given me another reason to be scared. Was there a party high on the route, or natural rockfall? Yo lambone...definately don't want to give you any bad juju on the route. It fell on Sept. 28th in the afternoon. There was a party on pitch 6 of PO wall and I saw no one else on the wall to our right. It looked like natural rock fall and it appeared to have fallen from high up the wall. The rock did not appear to hit anything on the way down other than the footstool and talus. The wall is pretty concave up there. The PO team above us thought it fell high off the route. So this is good news and bad news. The NA wall passes left and then back right at the top so it is likely that the rock could have fallen from a number of routes near the top and that rock wanted to come down and has. So less loose rock above. The bad news is that rock fall is never cool. I would bust up the first few pitches fast and not hang out at the base. Also that part of the wall seems pretty sleepy right now so the chances of a party above seem pretty low (there is a rope fixed up Sea of Dreams but havent seen anyone on it). My psychic tendencies predict very good mojo for you so I say go for it. #4 Camalot was our biggest piece and I remember being forced to leave it a body length or more below the bolt shown on ST. Grovelled toward the bolt, stood on it, grovelled above for some indeterminant length (I don't remember being horrified, which doesn't mean it wasn't horrifying) to smaller cam sizes around the roof. Roof had some loose flake type things, not to freak you out any more. I did this route with 2 bros about 2 weeks ago. I would just like to say that the bivies on this route were classic (ie. Big Sur, Black Cave, the Igloo). The climbing was fun as well. That said I would like to encourage all future parties to keep the hammer in the pig if you can. (Definitely bring hammer and heads as back up.) The last pitch, I feel, goes at C3 if you have the right gear. Gear To Have: Aliens, TCUs, Cam hooks and Ballnutz (aka loweballs). The other crux pitches were P4 and P7. The over all traversing nature of the route definitely adds to the difficulties. Tips: top of P4 to top of P2 is about 5 -10 ft shy of 60m if fixing; P2 to ground is fine; Easy Street bivies 1 okay not 3; 1 haul from top of P12 to P14 then link P15 and P16 both w/ 60m line; be careful about loose rock there is still plenty of it up there. Great route so go out and enjoy! I agree with last poster, we did this in '97 hammerless but you might bring one. If you're a strong free climber, this route goes pretty fast, you can FF 5.10+/easy 11 for much of it, especially above the igloo and below the Black Dihed. Beware the last pitch tho; we thought that was the crux~maybe we were tired and it was raining that day but it felt tricky...be sure you're solid on jugging traverses, too. RESTATING THE BELOW: This post and the next have detailed beta that could alter your "adventure" exprience, so read at your own risk. We climbed this route right after Lambone. We had a similar experience, so I will only add any differences. We also took a 4.5, I would take it again. Apparantly Lambone is braver than me, because I took 7 or 8 sawed offs, and would take all but one size again (and if I was reading this and didn't know exactly what pins to take, I would take all again). Our 60 m rope DID NOT reach to the ground from P2 until we extended the belay very low with our cordalette. I believe the topo for P7 is confusing. I changed the cam hook section to "C1 to 5 inches" and the cam hooks come into play on the C3 or A1 section after the pendo. We hauled at the first anchor on Big Sur and shuttled our stuff. It was still a very hard haul but the ropes did not get stuck. We linked 14 and 15. (We didn't link 13/14 or 15/16 then of course). Pitch 16 can be called C2, but nothing "fixed". 19 was an epic haul for us and in spite of monitoring, haul line got jammed in a flake before I started the haul. WE DID NOT MOVE THE BELAY AT 19. If you do not move the belay, you cannot link 20 and 21. We used most of our rope on 20 and were planning on linking but could not. P20 has some fixed pieces for lower outs, but I wouldn't call it "fixed". I hooked (without free climbing) up to the traverse. We linked 22 and 23. That chicken bolt with no hanger on P 24 should be chopped as it is not even helpful in the climbing and is a distraction as well as a danger. I agree with Lambone below that this route was much harder than I was expecting. Compared to Zodiac, The Trip and Mescalito and how they ended up feeling to climb based on the SuperTopo ratings, this felt much harder than I was expecting, while those routes felt like exactly what I was expecting. Not that I would say that the ratings were off base, maybe they were more true than ratings seem for other routes. The free climbing was quite stiff and we were surprised by that time after time. Just did this route over the course of a week, taking a casual 4 pitch per day pace. This was nice because we got to visit all the stellar bivis on the route and take our time on the complicated traversing pitches. The route tooks us longer then we planned due to its cicitouitus nature. I thought the route was more difficult then the rating suggests, definately more complicated (if not more technical) then Zodiac and Tangerine Trip. I didn't think the climbing was all that loose, but there is surely loose stuff if you get off route, and for your haulbag to knock off. I've wanted to do this route since I started climbing walls, and reading the FA account in the "Vertical World of Yosemite," and being up there really gave me an appreciation and respect for the adventure the FA team must have had. I kept wondering," what the heck were those guys thinking!" Burly. After seeing the route first hand I would never climb it with another party above me. Rack- Alien offsets and HBs and cam hooks! Bring a big hook. Supertopo pin rack is too big. Bring 3 Arrows and 3 Sawed Offs and one big beak. Bring Cinch hangers for the jingus bolts and fresh lower out sling to relplace tat. We brought a #4.5 camalot and used it several times. Nice to have, but you could get away with just a #4. Bring a 100ft minimum lower out line. Not lowering out the bag carefully in some pitches could cause you to send loose blocks on climbers below or lurkers at the base. Bring a emergency bolt kit. There are timebomb lead bolts on p5,p18,p19,p21 and 22. Bring free shoes and chalk, there is some heady mandetory free with minimal or no pro right off the belay, or getting to the belay. p1-4 are the technical cruxes. 1 60m rope fixes from p2 to the deck. A FULL 60m haul from 2 to Mazaltan Ledge, our bag tie in was to long and we had to haul on the tag line. p5- Stout chimney! Bring a big bro or bust free moves to the bad bolt. Place a nut in the corner of the roof to prevent the rope from getting stuck! p8- 5.6 is sandbag, bring free shoes and chalk, it is a runout friction traverse. Pitch goes way right then way back left, more then the topo shows. El Nino bolts are off route. p11 to Big Sur - Cool chimney! Pass BOTH the lead line and haul line around the chalkstone and redirect the lead line to the bolt so your partner doesn't have to jug through the chimney. We thought the 5.6 was also sandbag, felt more 5.8ish to me. Hauling to the (climbers) left anchor on Big Sur is difficult because the line gets caught on flakes below the ledge, it may be better to haul to the first (right hand) anchor on the ledge and shuttle the bags across the ledge. We had a mini hauling epic here. This is the first place you need to lower the bag out. p12 is really cool. For some odd reason there are 7 bolts (not 2 as shown) where you penji. p13-14 link as a 60m stretcher, back clean until about 20ft above the belay on C1. You need to lower yourself off the belay with a seperate lower out line, because you won't have any slack in the lead line. p20-21 link, build your own belay. Carefull lowering out your bag here, there is loose talus waiting to be knocked off. We used the optional belay shown and it seemed safer becuse it's free moves with no pro above a ledge. p22 and 23 link, don't get suckered into the EL Nino bolts. p24 has what looks like a chicken bolt on the arete by the C3 section. It is a threaded 3/8 bolt with no hanger that sticks out 1 inch, I was worried it'd chop my rope if I fell, it is in a really bad spot. p27 - I din't think this was C4F. There is no fixed gear on it. One cruxy cam hook move, the rest takes bomber Alien offsets and small brassies. Free the 5.7 friction up to the bolt shown on the topo, back it up with Camalots and do your last haul from there. Not to bad for a summit haul. SUCH A COOL ROUTE! A literal TOUR of El Cap! Some of our beta about this route. For those with small pockets my partner and I had only the blue-black offset alien with us and had no problems, so if you can't find 'em you'll survive! We each hand placed one half inch sawed angle (one on the second and one on the third pitch I think). Other than that we used no pins. I thought the clean cruxes were the second half of pitch 7 (from the penji to the belay) and pitch 20 (pretty necky) The "C4" final pitch is probably C2+ with bomber cam hooks from the belay to the good cam slots. Probably my favourite route I've done on El Cap so far!!! Reading these comments really makes me feel old. I did this route with a New Zealander named Bill Denz in 1977. It was both of our first El Cap route. Luckily for me Bill was a major hard man. It was still rated A5 at that point in time. I just remember it was very physical. We topped out with Dale Bard and Ron Kauk who were next to us on the FA of Iron Hawk. First thing - just get on it! This is an outstanding route and doesn't seem to get the traffic it deserves. We found it every bit as good as The Shield, and has more of a feel of 'starting from the ground and getting to the top (if you compare it to the typical team on The Shield who will start from Heart). It is really noticeable how the line weaves around to use available features - a real testament to the first ascentionists' ethos to use as few holes as possible. Eric Sloan's graded list puts this just between Mescalito and The Shield and we'd agree with that assessment. It certainly shouldn't be underestimated (I get the impression that people figure it moderate because it was the 3rd route to climb The Big Stone - just check out the pitch grades before you dismiss it!) 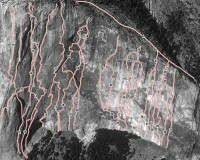 The top pitch gets C3 or C4 depending on which topo you use. It certainly has a bunch of cam hook moves straight off the belay. See the TR for a bit more specific beta. WIth the right cams I think you can tame it to C3 but I'd happily take the C4 :-) maybe split the difference and call it C3+. Don't underestimate the fact that this is the final pitch - a bit of a rarity to top-out with the crux and something else that sets this great route apart. We climbed the route hammerless and didn't hand-place any pins either (though a beak came in handy a couple of times). We did, however, have hammer and the pin and head rack from ST in the bag. More importantly, we also carried a clip stick and used this a few times to bypass blown heads. I guess we could have hammered new ones (or better style - placed beaks in them and hoped). Make your own choice. We'd read that the route required quite a lot of mandatory free climbing which was pretty 'heady'. We didn't find it too bad (may have used hooks where others went free?) and though we took rock shoes and chalk, we wouldn't bother if we did it again. Ref the ST suggested rack, we'd probably thin out the pin and head rack a fair bit (see above). We used cam hooks on numerous pitches - much more often than on The Shield or Sunkist) and a small but vital selection of hooks (maybe 2 each L/M/S). In terms of larger cams we just had doubles of purple (0.6") to gold (2"), which were adequate. We carried 2 blues (3") (and could have managed with 1), a grey (4") which was useful and a purple (5") which we could have done without. North America Wall is route number 19. It's climber slang for information or tips on a route as in, "what's the beta on that route?" As a service to fellow climbers we ask SuperTopo guidebook users to post tips and updates to this website if they have relevant information to share after a climb.